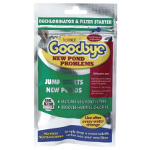 Goodbye New Pond Problems is designed to minimise the effects of New Pond Syndrome in ponds by speeding up the maturation of new pond filters, in addition to removing harmful chlorine introduced with tapwater. This will help to safeguard the health and wellbeing of fish in a new pond, making the first critical weeks of pondkeeping much easier. A concentrated filter bacteria and enzyme formulation designed to seed and mature new biofilters, introducing the beneficial bacteria needed to create and maintain a healthy pond and filter. A dechlorinator that will quickly remove harmful chlorine introduced with tapwater. 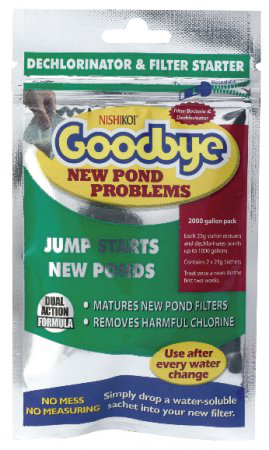 Each pack of Goodbye New Pond Problems contains two water-soluble sachets. Each water-soluble sachet (25g) treats ponds up to 1000 gallons. Simply drop one water-soluble sachet into the filter, under flowing water. That's it! The bag will quickly dissolve, allowing Goodbye New Pond ProblemsÃ¢¢ to get to work immediately.